One thing that all varieties of plums have in common is that they are very nutritious. Plums are high in fiber, low in cholesterol, sodium free and rich in Vitamin A & Vitamin C. Like other fruits that are high in fiber, plums are great aids in reducing the risks of cancer and heart attack and sustaining healthy cholesterol levels. As plums are high in fiber and natural sugars, they help maintain bowel regularity. Plums and prunes are great to help with constipation. Prunes, also known to help maintain bowel regularity and alleviate constipation, are really just plums that have been “dried”. Recently, you may have noticed that “prunes” may be scarce or no longer available at your local grocer. There is a move to try to make “prunes” more appealing to a wider variety of consumers and so they are now being marketed as “Dried Plums“. When can my baby eat plums and prunes in baby food recipes? Neither plums nor prunes pose a high allergy risk. These fruits are recommended to be introduced to baby anytime from (4) 6 months of age. Please do keep in mind the recommended age for introducing solids is 6 months of age. According to the EWG, plums and prunes one of the foods least contaminated with pesticides so purchasing organic is your choice. Like many other fruits, plums are very delicate. While plums will store well, you should purchase them for use within a week as the longer they are stored, the more they become bruised and softened. Choose plums without bruising, soft spots or cuts. When selecting dried prunes/plums, always try to purchase natural, those that have not been dried with any type of sulphurs. Many health food stores and conventional grocers are now carrying plums that are not dried and preserved with chemicals. Prunes are always dried plums no matter the method use to “make” them. However not all plums are made into prunes. Many commercial prunes are now being called “dried plums” as marketers have found the public is more receptive to purchasing dried plums rather than “prunes”. If you ever get the chance, compare “real” dried prunes to those that you will find in a can or packet in the grocery store. Plums that are dried either via a fan, a food dehydrator or dried in the sun will not be as slimy looking nor will they be as shriveled as many commercially dried plums/prunes. Think of it as you think of the difference when looking at homemade baby food and commercial baby food; it’s difficult to imagine how they can possibly be so dissimilar. Use any number of ripe plums that you desire. Halve the fruit, pit and place “open” side down in a pan filled with 1 inch of water, bake at 400F until soft and tender or puckering of the skin appears. Place fruits into a bowl of cold water, roll around and slip off the skins then cut and pit the fruit. Puree as with any other fruit, adding lots of liquid if needed. Step 1: Soak dried prunes in warm water until they plump up or steam gently. Step 2: Once plump and tender, toss into food processor or blender and begin to puree. Step 3: Add liquid without sparing any. 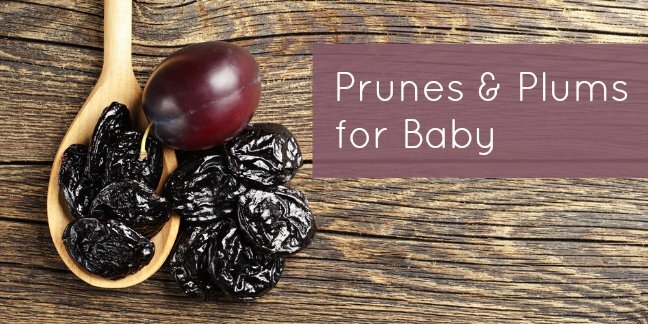 Prunes tend to become a pasty gluey consistency when pureed and the more water you add, the easier it is to puree to a texture your baby will tolerate. Like apricots, prune puree will not freeze into a solid block. The skins should not pose an issue however do be certain to keep a watch for baby’s adverse reaction to the possible texture. You may wish to mix the pureed prunes with a beloved food for the first try. Add plum purée and Yogurt and/or Juice or water until the proper consistency for your baby is achieved. Puree in a blender or food processor if needed. Add all fruits and water to a medium saucepan. Bring mixture to a boil over medium high heat. Turn to simmer and check frequently so as not to run out of water. Allow to cool and then blend or puree as needed for your baby’s preferences – Add to cereals, yogurt or even drizzle sauce over meat puree or meat dices. Using frozen peaches is a great way to offer your baby “fresh”, in-season peaches all year long. Take a few slices or dices out of the bag and then gently steam or simply thaw and mash/puree. You can refreeze steamed peaches if you wish but making a few servings at a time to store in the refrigerator is best. Water, is it Necessary for Baby?